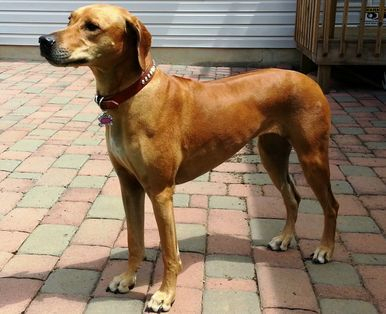 Khoi was bred by Craig and Karla Boreiko of Tam Lyn Ridgebacks in Durham, North Carolina. Khoi is spayed and will not be used in a breeding program, due to Autoimmune Thyroiditis. After consulting with Dr. W. Jean Dodds DVM (with 40+ years of scientific research) on all of Khoi's thyroid test results, Khoi was spayed. Allergies: Khoi suffers from grain allergies and is on a grain-free diet. 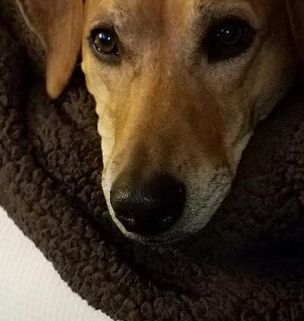 Khoi has also had several adverse reactions to her 1-year and 3-year Rabies vaccines (2007, 2008, & 2011). The likely reason for these ailments was due to the underlying thyroid disease. After starting Khoi on twice daily soloxine, she lost the weight she had gained and her skin cleared up tremendously. 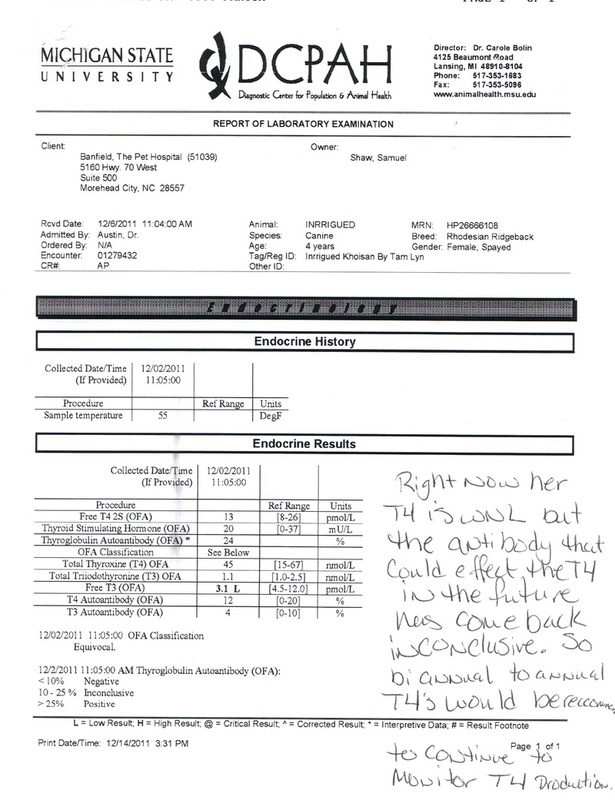 The rising TgAA was clear evidence of thyroid disease, even though the OFA panel said she was equivocal at the time. *** You will notice on Khoi's OFA page her thyroid results listed range from Normal to Equivocal to Autoimmune, then back to Equivocal. The reason there is such a wide range, and waxing and waning is because she is now medicated. This is proof that once you medicate a dog for the disease, they can pass the OFA thyroid test. I fully expect the next test to come back and show "normal" on the OFA scale. 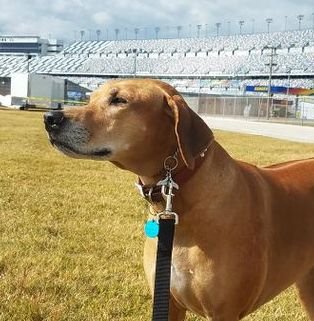 For more information on the health testing done here at Semper Fi Kennels Click Here. WB & BOS for 2 points, Monroe Kennel Club, Oct, 2010 to finish her Championship. NBQ & 4th place at the ASFA II in the open class, May, 2011. 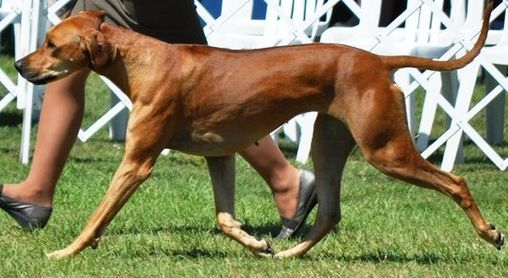 Khoi is pointed in AKC & ASFA Lure Coursing. Above, Khoi at almost ten.